Leadership demands courage. This book is about a way of life that names and explores this important resource and shows leaders how to access and draw upon courage in all that they do. It has its roots in the work and thought of Parker J. Palmer, who, over forty years of teaching, speaking, and writing has explored the human spirit--what he has called "the inner landscape"--and its role in life and leadership. The book offers specific practices developed by the Center for Courage & Renewal to build courage in seven key areas- the courage to become self-aware, to answer your calling, to question and be a deep listener, to see both/and and as a whole, to choose wisely, to connect and trust in each other, and to stay in the game...or leave. This book inspires leaders to reach inward to discover and trust in their true self and reach outward to bring their unique self into the world. Start reading The Courage Way: Leading and Living with Integrity on your Kindle in under a minute. "Shelly Francis has written a beautiful and important book. Of all the requisite virtues of conscious leaders, courage is one of the most essential--the courage to do what is needed to promote human flourishing and growth and the courage to withstand the inevitable pressures to conform to business-as-usual and to treat people as disposable and interchangeable objects. This book is the finest treatment I know of this vital subject." --Raj Sisodia, F. W. Olin Distinguished Professor of Global Business, Babson College, and cofounder and Chairman Emeritus, Conscious Capitalism Inc.
"Our culture and our planet are in crisis. Not shying away from this truth requires courage. Stopping the rat race we are all caught in to discern how we are called to respond requires courage. Acting on that knowing requires courage. How come the word 'courage' is almost completely absent from leadership literature, then? Perhaps because we too often reduce leadership to becoming successful and making it to the top. I'm relieved to find a book that holds us to a higher standard and offers guidance as we wonder: in these peculiar times, how can we find the courage to live the life that wants to be lived through us?" "For many years, the Center for Courage & Renewal has been preparing us for this 'post-truth' era when courageous action is demanded from leaders who care about people and planet. We need leaders who put service over self, who know what they stand for and stand there. We need leaders who are committed to serving people, who recognize what is being lost in the haste to dominate, ignore, and abuse the human spirit. I am deeply grateful for this book as a guide and support for moral leadership as we face the darkening future." --Margaret Wheatley, author of nine books including, most recently, Who Do We Choose to Be? "This is the book that won't claim to change your life, which is exactly why you can trust that it probably will. What you will find in these pages is no less than the technology to tune into your true self--your real intuitions and outrage and intelligence--and a sense of how to show up in community with that revitalized understanding of your own power. In a cacophonous world like the one we're living in, I can think of no more critical or renewing opportunity." "The Courage Way gives us a much-needed social technology for self-expression and authentic relationships. With intimate leadership stories, it shows how integrating purpose and cultivating community can be a powerful catalyst for change." "At a time when civil discourse reflects a lack of trust in leadership and when the integrity of our leaders seems in doubt, Shelly Francis offers us a path to renewal. Her insights into cultivating courage through daily practice provide a much-needed guide to authentic leadership aimed at prosperity and flourishing. Essential reading in today's world!" "The Courage Way will nourish that part of you that cares deeply about the world. A soulful approach for helping you harness your inner strength to become the kind of leader the world needs now--in every dimension of your life." "Everyone should read this book. The Courage Way is a powerful tonic for our challenging times. Keep it close at hand so you can savor its life-giving music again and again." "The Courage Way forever expands the way we think about courage, bringing its many manifestations to life and proving that acts of courage, whether physical, moral, creative, or otherwise, have their seeds within each and every one of us. The poignant stories that Shelly Francis shares make the heroic qualities of courage more understandable and accessible than ever before. This would be an important book at any time, but at this moment, when America is divided and hurting, it illuminates the courage within that promises a way through. Read and re-energize!" "This is an important read for leaders at all levels. I am inspired by the promise and potential of leaders and organizations as forces for good, and this has never been more important in the world. The Courage Way shares time-tested tools, reflections, and guiding principles that every leader can learn and practice. This can move leaders and their organizations toward flourishing through creating human-centered cultures guided by strong ethics and integrity." 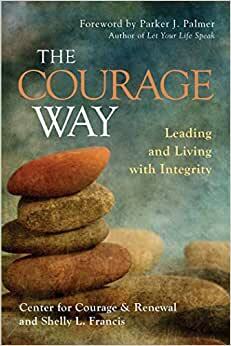 "The Courage Way by Shelly Francis is a wonderfully written book for all those who wish to lead their personal and professional lives in alignment with what truly matters. Happiness is unthinkable without courage, yet until now, little has been written about how to muster this great virtue. The book is a must-have resource --inspiring! "What would you do with more courage? From that first provocative question to the last story of people learning to lead and live in deeper alignment with themselves, The Courage Way is a surprising and counterintuitive remedy for the heart-sore. My calling is to sit with those whose hearts have been broken open by their calling, by their deep desire to live life in synchronicity with their truest values, beliefs, wishes, and dreams. The Courage Way offers a way to do that gently, yet it fiercely offers ways forward. Shelly Francis and the Center for Courage & Renewal have again demonstrated their ability to lead each of us into a new way of being." Based on the work of best-selling author Parker Palmer and his Center for Courage & Renewal, this exploration of the inner life of leadership shows how to become a better leader by orienting yourself, your life, and your work toward greater courage, wholeness, and integrity. This phrase, in the preface of Shelly Francis’s book, captured me. It immediately brought to mind what I would do. I find Francis’s driving question to be important and timely. These days, leading has never been scarier. The landscape “out there” is changing more quickly than ever, the future can’t be predicted by studying the past, and people are less and less trusting of institutions and their leaders. As a result, the landscape “in here” – our inner state — is taking a beating. The leaders with whom I work report feeling exhausted, fearful, isolated, and discouraged. And these emotions can get expressed in less-than-productive ways like aggression (fight), withdrawal and avoidance of hard conversations (flight), indecision (freeze), and “us versus them” rhetoric (flock). 5.0 out of 5 starsLeading is not for the faint of heart. To lead boldly, honorably, meaningfully, and impactfully one must lead courageously. Thank you, Shelly, for inspiring us to lead courageously through your wonderful insights and words of wisdom. I will be purchasing copies of your book for each of the Members of my organization's Board of Advisors and Board of Directors. At a time when our world's leaders seem adrift, untethered from civility, humanity, and most of all COURAGE, your book provides us with the hope that all is not lost. Great ideas for living with integrity and courage! 5.0 out of 5 starsA superb book from an enlightened organization! I highly recommend this book to leaders of any organizations. 4.0 out of 5 starsCourage is not only in you, it IS you. I opened this book for the first time right as I was beginning to make the decision of whether to leave the organization I've been a part of for almost 10 years. Courage...I've been needing a lot of it! Shelly Francis dispels the commonly held myth that courage is most needed to make huge leaps and heroic decision. Instead, courage may be needed most to stay where you are and move at a snail's pace, utilizing what you have in front of you instead of leaping to what's next. This very cerebral book was balanced by copious examples of courage in real-life leadership and work situations. If you're looking for a book that will challenge you to think outside of the norm about leading, this is the book for you.